Imagine…if rents didn’t rise, Imagine….If mom-and-pop shops didn’t have to disappear… I wouldn’t be writing this now. Anything to do with The Beatles is always in news. Came to know that a café in Upper west side, Manhattan, NYC called the Café La Fortuna which was patronized by John Lennon and Yoko Ono, is having to close down. The café started in 1976, was run by the husband-wife team of Vincent Urwand and Alice Urwand. This was another mom-and-pop store not able to withstand the affects of gentrification and the monstrous spread of retail chains. Rising rents have affected the sustainability of many such enterprises. In this case apart from these extrinsic aspects, the intrinsic aspects seem just as compelling. The original landlord died a few years ago. He had maintained the rent at low levels not going by the increasing rents in the neighborhood.. The demise of Alice Urwand (in this January), who was known as the “heart and soul” of the café, ultimately led to the decision of shuttering the business. For the past few years the café was run by the family friend (and one of the owners), Michael Trapani. Sunday is supposed to be last day of the café. Like many mom-and-pop shops, this café also exuded the homely warmth which the regular customers basked in and incited the non-regulars. It was in the café, in a comfy corner, that John Lennon would sit and pen his songs and doodles and sip coffee. The table where John and Yoko spent so much time was recently presented to Yoko by the café. Another table with them is being considered to be given to the museum. It is like a piece of history/legend going away and sad as it is, guess change is inevitable. People try to hold on as much as possible but at one point you have to let go – make way for something else. Maybe that “something else” will also be a part of history or some new legend in the future. 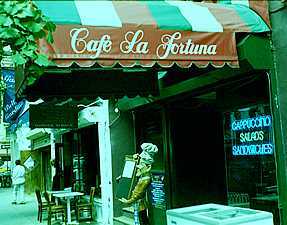 Café La Fortuna calls itself an “authentic Italian café.” It is located in the Upper West Side in Manhattan (address: 69W, 71st St. NY-10023). It is located between The Dakota (Lennon’s residence) and Lincoln Center. It has indoor seating and also outdoor seating in its small garden. It was open till midnight on all days (Till 1 AM on Friday and 1:30 on Saturday) welcoming in the pre and post theatre crowd (since Lincoln center was nearby). Its menu contained Pastas, salads, soups, pizzas, sandwiches, desserts, hot and cold beverages. The café has seen a number of celebrities visiting it. All the café’s memorabilia related to Lennon has been maintained in the café. Its walls exhibit photographs, drawings, disc and memorabilia of celebrities and the café’s past. this was a really cool, quaint place, been there a few times. some of these studios should have stepped up and sponsored / maintained this place, instead of chasing some school kid that downloaded some song from the internet !